The No Coast Drift Party 8 "The Ocho"
Get Social with me... Let's hug. 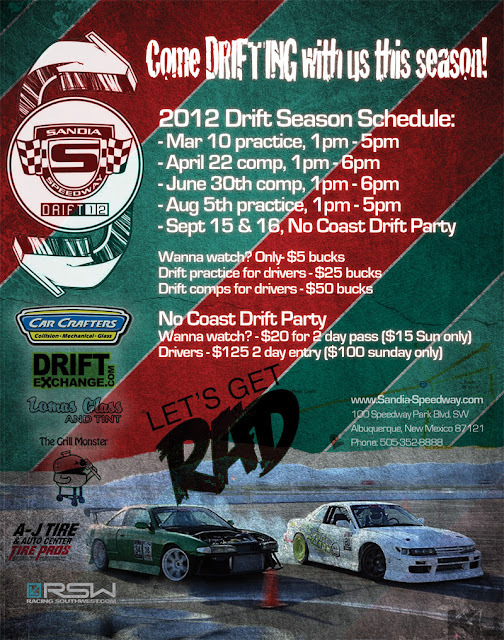 I just finished the drift schedule flyer for the Super Nationals event here in Albuquerque, NM. I like it.Epic photo by Kyle Pope! Hope to see some of you all at our event!!! ;) i like it too! I love drifting. I run local drift events here in Abq. I ride BMX. I snowboard. These are my exploits. Sandia Drift Night - October 2010 from Stephen Leeper on Vimeo. KEEP DRIFTING FUN abq from santi romero on Vimeo. Dan Brockett 2011. Picture Window theme. Theme images by enjoynz. Powered by Blogger.